Do you ever read a book, or trip over it, really, and when you stand up it’s a day later and you can’t concentrate on any of the other things you thought you loved even though you can’t fully understand why? And somehow, that tripping hazard is gone, finished, but you’d rather it not be, and then you just laugh because the protagonist is a fangirl and it’s so unbelievably appropriate to feel this way that there’s nothing to do but laugh and gnash your teeth and wonder why your mouth tastes sort metallic and stale. I’d never even heard of this book or this author, and her name is Rainbow, so I was all set to be annoyed, but then I couldn’t be because it was so loving and perfect and I’d never read anything else quite like it. Because yeah, a lot of my friends are Fans with a capital everything, and they were reading fic before the internet was even really a thing. They used to print out reams of it and share back and forth, awake all night long because otherwise one might accidentally spoiler the other, and I never understood it, but that’s because I was always busy writing my own fic in my head. I just didn’t realize that’s what it was. The stories were always there after I finished a great book or movie, or if a show I watched disappointed me; they crowded into my head, waiting to be twisted around to something better. I didn’t know it made me a fangirl until maybe a year ago. Then I finally admitted it, but I felt like I’d come to the party so late that all I do was stand in the corner and watch other people do this thing better than me. It was like being back in a junior high gym class, but this time the jocks didn’t care; it was all about the sparkliest nerds loving each other, and I still felt as invisible as I was back then. New clique, and cliques still weren’t my thing. I’ve always been more of a drifter, keeping the stories to myself, straying from the group because groups are loud and hard and exhausting. It’s easier to just have the stories and to have friends who tell me about their groups without my ever having to meet them. I like it that way, even though, yes of course I’m jealous, sometimes, that I wasn’t made in the right shape to fit into groups, but we can’t have everything and when it comes down to it, I’d rather have the stories. And when I saw this book, I thought, she’ll never get it right. It will be a stereotype, and the girl will be forced to completely change for anyone to like her. She’ll have to give up living in one world to be a part of another, but then she doesn’t, and it made my heart so happy that I couldn’t do anything else but write this. Because this book is sweet, and it’s funny, and I love how Rowell know that it really isn’t impossible to get the best of both worlds, even if it takes some juggling to get there. 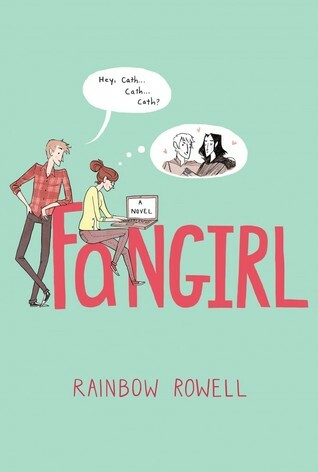 For more about Rainbow Rowell, who has become my special unicorn of happiness in just twenty-four hours, click here. I wonder for how many of us reading your blog this line of yours is so absolutely perfectly true … “when it comes down to it, I’d rather have the stories”? It was utterly delightful. I hope you enjoy it. I did fan fiction as an intro into writing when I was a young girl, maybe as young as twelve. Before then I just wrote stories about girls my age. I think it’s an admirable start into writing, but I never shared them with each other. Once I started growing, I slowly worked myself away from them and began creating my own stories, my own characters, and my own worlds. I think this blog is my favorite place to party :) So many fun people who want to talk about books I love…doesn’t get much better than that! This is on my list of to-read books! So excited! I hope you like it! I had so much fun reading her work! I certainly loved it. I hope you do as well! I’ve been trying to save her other books because I had so much fun reading this one, but I don’t know how long I’m going to be able to hold out :) I hate when an author I like only has a few books to read. All my favorite writers should be as prolific as Pratchett so I never have to worry about that problem! I agree. She has a fourth book coming out next July and that is far too long a wait. July?!? NOOOOOO! I can’t wait that long! I finished this book yesterday actually, and am now suffering from a serious book hangover. My only complaint was that it ended too quickly! I became so attached to the characters. I recommend Rainbow Rowell’s Eleanor and Park next. It’s an incredibly realistic and raw love story. This was totally a book hangover type of novel! I can’t wait to read her other work, but I’m trying to hold out so I can enjoy them after I’ve had space from this one! It seems like Eleanor and Park is the one most people think I should pick up next, so that’s my plan. That seems to be the popular consensus! I’m definitely going to check it out! I loved this book to bits! I don’t think I’ve ever understood a main character so completely! Definitely my favorite book in a loooooong time. I know, right?! So wonderful!!! I agree with everyone else! I’m definately checking this book out, I read her book ‘Eleanor and Park’ and it was really good.